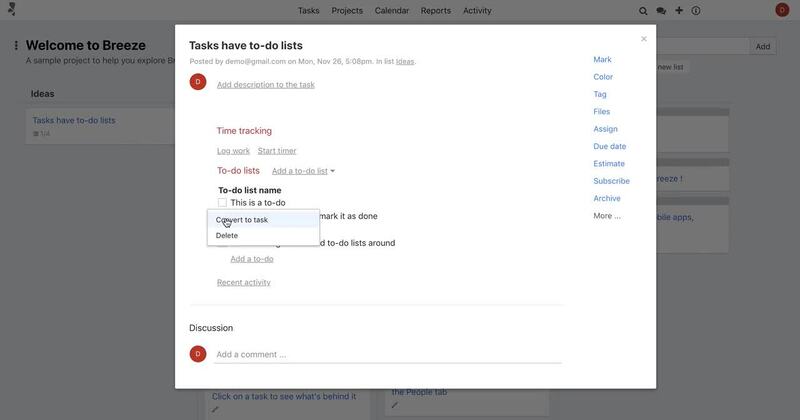 In Breeze, you can divide your work into smaller tasks by using to-do list and to-dos. You can also think of the to-dos as subtasks. Sometimes, however, it can get overwhelming when a task has too many to-dos. The best solution would be to move some of the to-dos to a new task. 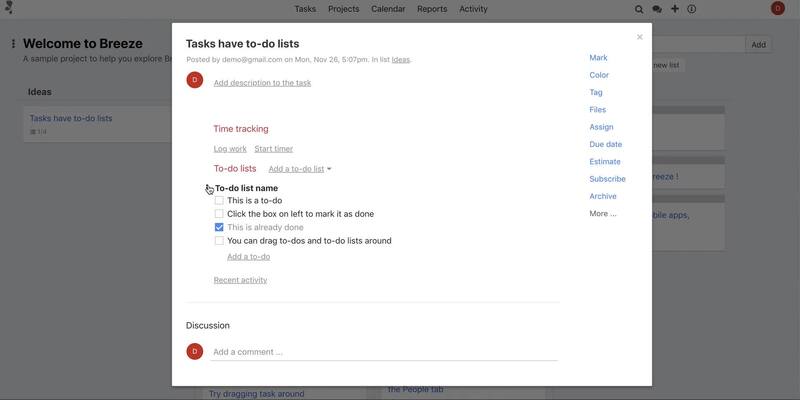 To make it easier we added two new features that let you convert to-do lists and to-dos to tasks. Dividing your tasks into smaller bits also helps you complete it faster. A large task can become overwhelming, it can be hard to get started and you'll get distracted. Small tasks, on the other hand, are something you can focus on and see the results instantly. How to break tasks down? The best way is to take a look at the task and ask yourself if the task is completing only one thing. If you see that it has multiple goals or results then it's a good candidate for breaking into multiple smaller tasks. The same works for to-do lists and to-dos inside the task. You can also see if the task has multiple parts or phases. Example, marketing, writing, development should each have their own task. The next thing to take a look at is the order of the task and subtasks. What needs to be completed first and what are the steps for the next task. This will help you set a timeline for your project. To get started dividing your work to more manageable smaller pieces you can convert to-do lists into tasks. This will create a new task with the name of the to-do list and move the to-dos to the new task. The new task will be added to the end of the current task list. Taking small steps is much easier than taking a big leap. You can also convert single to-dos to new tasks. It's a good option when you notice that a to-do is too big and really needs to be a task. It'll create a new task with the name of the to-do and append it to the end of the current task list. If the to-do had users assigned and due date then the new task will be assigned to the users and the due date will be also set. Breaking your large tasks to smaller bits lets you prioritize them and deal with critical tasks first. Taking small steps is much easier than taking a big leap.